Summary: The description, specs, photo and pricing for the Dan Wesson Razorback pistols. The RZ-10, chambered in 10mm. 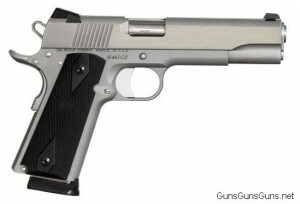 The Razorbacks were discontinued, but Dan Wesson is bringing them back for 2012. The company says availablility should begin in January 2012. .45 ACP 8+1 5″ 8.8″ 1.5″ 5.5″ 2.4 lbs. 10mm 9+1 5″ 8.8″ 1.5″ 5.5″ 2.4 lbs. The RZ-45, chambered in .45 ACP. This entry was posted in .45 ACP, $1,001-$1,250, $1,251-$1,500, 10mm, 1911, Dan Wesson, Full size, Semiauto on November 17, 2011 by Staff. 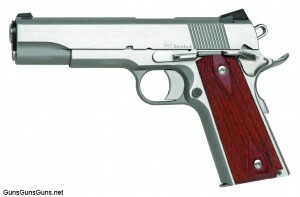 A superb pistol (mine is one of the original pre-CZ 150 run)smooth, outstanding accuracy, top end 1911 10mm. I put a compensator on mine to help with the follow-up shots… comparable to the Les Baer and Wilson 1911’s for sure.